Spoon Me! – #DoubleFML FatDarrellPalooza! Wait, don’t worry unromantics! That title doesn’t mean that today’s post will be a sequel to last week’s Valentine’s Day special. Nope. Instead it means that we’re going to be talking about cereal later! My Valentine’s Day went really well by the way. My girlfriend loved everything that I did for her so much that she actually cried! Although in hindsight, my pasta contained both onions and garlic so it’s also possible that my stank breath caused those tears. Either way, it was an emotional evening! Anyway, what’s up everybody? Welcome back to #DoubleFML FatDarrellPalooza! I’ll be a good boyfriend and wait, but if she can’t make it then either, I’ll be at the first matinee on Saturday morning! Based on what I’ve heard, I’ll probably want to see it more than once anyway though. Everyone who’s seen it has said it’s amazing! It also posted record breaking numbers at the box office this past weekend! Anyway, you know what we’re not going all out for this year? The Olympics. Don’t get me wrong, I’m still enjoying it and fully support all our athletes but where is the hype and fanfare this time? I know that the summer Olympics always tend to be a bit more popular, but the lack of buzz this year is still baffling to me. I also can’t remember a year where other sports didn’t stop their seasons out of respect for the Olympic athletes. Just this past Sunday, we had not only had Nascar’s major Daytona 500 event but we also had the NBA All-star game! Speaking of the NBA All-star game, did you catch that National Anthem? The Black-Eyed Peas are one of my favorite groups, so I love Fergie and all but um…yeah, well see for yourself! Wowsa. Francis Scott (Off) Key, oh my! Whiskey. Tango. Foxtrot. Somewhere, Rosanne Barr is smiling from ear to ear right now! That was definitely a memorable rendition to say the least! She has a great voice, so this was clearly an artistic choice but it’s definitely drawn some very mixed reviews. There’s even a “remix” out already! If the effect she was going for was “singing in the car as someone constantly slammed on the breaks and did donuts in the parking lot” though, she nailed it! It’s all good though Fergie, I still love you! What did you think of that performance? Comment below! Anyway, back to my point, ESPN also aired a full slate of college basketball games on Sunday and ABC aired The Winter X-Games which literally features many of the same events as the Olympics! Obviously, these are competing networks but even NBC had the nerve to play a regular season NHL hockey game instead of broadcasting live Olympic coverage! Perhaps that’s part of it? For the first time in recent memory, NHL stars weren’t competing, but I never watched The Olympics for that reason anyway (hockey isn’t really my jam…). Besides, there are a ton of other great athletes and events to watch (if you can actually find them. I’m still a bit underwhelmed by the coverage this year)! Are we really that fractured as a nation that we can’t even come together to rally behind our athletes for 2 weeks? I just don’t get it. But whatever, I’m still rooting for you guys! So, USA! USA!! USA!!! That reminds me, I still need to look up who came up with this biathlon event. Have you ever watched this? It’s cross country skiing combined with rifling. Huh?! They just slapped these two things together like it’s supposed to make sense? Maybe it was invented in some Viking territory where this combination of events may have been more common? Otherwise, it just seems like such a random pairing! I do enjoy fusion with foods though. Like shrimp and grits, chicken and waffles or even my namesake ®Fat Darrell Sandwich. So, hey whatever, I’m down. Oh yeah, and while we’re on the subject of food and Olympic athletes, my friend Mildred (what’s up Millie?!) told me about American luge sensation, Chris Mazdzer’s, feat of eating an entire slice of pizza in one bite! Before we get to that, let’s first give Chris a big shout out for becoming the first American athlete to win a medal of any kind in the luge events. He took home silver in his third Olympic games after attempting to reach the platform for 16 years which is a testament to his incredible fortitude and perseverance! That’s such an amazing story that we might as well just make that the fitness tip for today. Never give up on your goals! Instead, learn from each failure and use that knowledge and experience as motivation to push forward and try again. Hard work really does pay off in the end! Do you have a fitness question or accomplishment you’d like to share? Tell us in the comments below! Awesome job and very inspiring stuff Chris! That pizza feat though? After reviewing the footage, I don’t know man. Call me the Russian judge or whatever you’d like, but I’m not as impressed. Here’s a link to the video if you’d like to see for yourself, but for those of you who don’t feel like clicking over, I present the follow photo montage for your review. Okay, yes, he did eat the entire slice but look how tiny it is! My 6-year-old nephew Domonick could probably eat that whole slice in one shot too! And you know that I could! Maybe that’s what pizza slices look like in South Korea, but I’m from New Jersey, the land of big hair and even bigger pizza slices. I doubt anyone could swallow an entire slice of Jersey pizza down in one gulp! …well, aside from Stormy Daniels perhaps, but I digress. Anyway, if Chris wants a real food challenge, he should try that with a pizza from The Garden State! 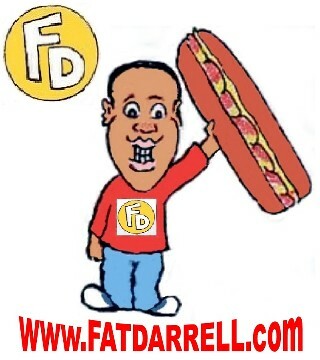 Better yet, he should try the ®Fat Darrell challenge of eating 5 of my namesake sandwiches in only 45 minutes! Now THAT would be impressive! I’ll even officiate the event personally! I may have to reach out to his reps and set this up for real, the more that I think about this, it’s actually a great and fun idea! As greedy as I am though, timed eating really isn’t my thing. It’s just not fun to me. I’d rather savor the flavors and enjoy each bite. Of course, that’s not always possible when I’m trying to squeeze in a meal between appointments. Just last post I told you about taking down an entire pizza in less than 30 minutes (including drive time and ordering) so yes, it’s possible but not preferred. Oh, and don’t even get me started on those hot dog eating contests where they dip the bread into water so it slides down easier? Now that’s just disgusting! Even the thought of that gross, cloudy water with soggy bread crumbs floating around in it skeeves me out! No thanks on all of that, I’ll pass. So, could I down that tiny slice of pizza in one bite? Absolutely! But would I? Maybe on a dare, but otherwise, nah. Besides, in the Olympic village you know that baby slice probably cost him like $12! I’d definitely stall finishing that to at least feel like I got my money’s worth. Oh yeah, speaking of pizza, here’s that shirt that I referred to earlier! Wow, this shirt raises so many questions! Hmm…that last question may be the biggest mystery of them all! Speaking of pizza, check out this photo that Melinda Corse (yep, the same chick who wrote that savage Fergie status post earlier!) posted in our Facebook foodie group, Phenomnomnomenal, the other day (join now by clicking here)! Based on my experience so far, I’d have to agree! I’ll still give Chicago’s version a try one of these days though. Oh yeah, and check out this cake! Oh yeah, and before we close the Olympic Village food discussion, check out this McDonald’s location on-site at the games this year! Really Bro? Where is your McManager? How cool is that? It looks just like a combo meal! Well, aside from the fact that the hamburger is actually centered on the bun instead of thrown on spastically like they do at actual restaurant locations! How is that even possible anyway? You had ONE job…sheesh. So, if you haven’t heard about this yet, since digital music sales now dominate the market, starting this summer, Best Buy is planning to stop selling CDs! Target has also decided to now only sell CDs on a consignment basis which means they’ll only need to pay the record label after a customer purchases one instead of buying a bunch of albums in bulk and being stuck with the unsold inventory as they did in the past. I suppose that it makes sense since digital streaming music currently accounts for 62 percent of US album sales, but it’s still kind of sad to see them go. Although most of my recent album purchases were digital, I always preferred the actual CD for my favorite artists. I loved flipping through the insert and reading all the credits and lyrics. It just didn’t feel the same viewing it on a computer. I remember once having towers of CDs proudly displayed in my living room to show off my collection. I did the same for my DVDs – which I’m guessing will start disappearing next. Actually, I just saw a commercial for The Justice League Movie which is being released for home viewing soon and instead of promoting Blue Ray and DVDs, the commercial only mentioned iTunes! According to the articles that I read about the Best Buy situation, they’ll continue to sell vinyl albums for at least 2 more years due to an agreement they have with Billboard. Vinyl will always have a place though because it’s retro cool. The jury is still out on how CDs will be remembered in a decade, but now that they’re slowly being phased out, people are already beginning to fondly reminisce and appreciate them a bit more. That’s all well and good but you know what piece of music technology never quite got the respect that it deserves? The cassette tape. That’s right, I said it. The cassette tape! So yes, vinyl was first. It’s got that amazing, raw vintage sound that’s unbeatable. I get that. But you couldn’t listen to that record in the car so 4 and 8-tracks were born to solve that issue. These old relics held either 4 or 8 songs on a cartridge that was playable in a car but they were still clunky from what I’ve seen of my parent’s collection (these were phased out by the 80s. They’re a bit before my time so I don’t have much personal experience with these). But okay, we had records for homes and 8 tracks for cars but what if you wanted to play music on the go? Or play more than 8 songs? Ah yes, that’s where the mighty cassette tape comes in! The cassette tape was the first portable music technology, yet nobody wants to give it its props! How many iconic 80s movies featured a “boom box” blasting mix tape of some sort? What about the iconic scenes in Breakin 2: Electricboogaloo? You think Turbo would be able to dance on the ceiling without the cassette in the boom box? Nope! There would also be no iPod (or the Sony Discman that played CDs) without the OG Sony Walkman cassette tape player! Cassette tapes even gave you the power to record live radio broadcasts! Okay, granted, it wasn’t all good though. You had to manually fast forward or rewind to each song that you wanted. The magnetic audio reel inside also used to get pulled by the stereo equipment at times but it was an easy fix so long as it didn’t rip and you had a number 2 pencil lying around! Oh yeah, and check out my current #DoubleFML business cards! So, needless to say, when they finally make their triumphant comeback, I’ll be ready! And before any of you try to call the team from the show Hoarders to come clean my apartment, don’t worry, I don’t keep everything! My music collection though? Absolutely! Besides, you never know when some of this old stuff will come back or just come in handy. Don’t lie, I know that half of you were jealous when I broke out my original Starter Jacket in the 90’s fashion show post! Anyway, here’s to you cassette tapes! Cheers! Hmm, for some reason I don’t have the same love for VHS which doesn’t make much sense but that’s a different topic for a different day. Enough of that nonsense, let’s eat! Since we’re talking about triumphant returns, it gives me great pleasure to make this declaration: Ladies and Gentleman, after a 10 year absence from shelves, I’m proud to announce that Oreo O’s Cereal is officially back baby!!!! Oreo has really reinvented itself over the past few years with all of the new crazy flavors, candy bars (which I still have to try) and candy canes. Bringing back the cereal just made too much sense and now it’s finally happened! Oh, but it didn’t come back alone! Oh no, with it, Post and Nabisco also launched 3 other cookie inspired cereals! I used to eat cereal like Pac-Man eats power pellets back in the day. I literally had about 20 boxes lined up across the top of my refrigerator at any given moment. I don’t eat it as often as I used to though so I had no idea that some of these new flavors existed! During my hunt for the 4 new Post flavors, I also spotted girl scout cookie cereals, one called Donut Shop which looks interesting and even Super Mario cereal with marshmallows that grow like the mushrooms in the game (hmm, I wonder if they can make me taller too…)! Those other brands will have to wait for another day though because today’s post is all about Post and their 4 new flavors (yes, I’m including Oreo O’s in that statement since it’s new too after a 10 year absence)! Anyway, enough chit-chat – let’s dig in and taste these! Normally my catchphrase is “May the fork be with you” but this time, I’m going to need a different utensil. Let’s get to work! Unfortunately, I’m not disciplined enough to “save the best for last” so first up? Oreo O’s! The Review: OMG YES!!!! These are EXACTLY as I remembered them! These legitimately taste just like the cookies. Wow. If you like Oreos, you’ll love this cereal! Wow, that was awesome. The review: Oh man, 3 for 3! These are also REALLY good! I was right about the Golden Grahams part, but some of you who also do “Frankenstein” cereal bowls (ie: mixing a bunch of them together) might understand this next statement. So, imagine a base of Golden Grahams but dump some Coco Puffs in there along with a few marshmallows and viola! That’s what this awesomeness tastes like. And if you can manage to scoop up all 3 elements at the same time, it really does taste like a S’more! S’more please? These are delicious! Overall Summary: Okay, Post wasn’t playing around when they made these. They seriously taste just like the actual cookies. I already knew that I’d love the Oreo O’s but I was equally blown away by the whole collection. Yes, I was greedy enough to combine them all after trying them individually! Unfortunately, you probably shouldn’t eat these every day. They’re not exactly health food. Plus, there are some artificial dyes and flavors in a few of these (read your nutrition labels kiddos!). If they can somehow manage to maintain the flavor profiles but use natural ingredients as many cereals are now doing, these would be absolutely perfect! Ignoring health for a moment though and speaking strictly about taste, they really knocked these out of the park. They’re Grrreea….oh wait, wrong company. Anyway, yeah, these are awesome! Oh yeah, and there are also cool facts about each brand on the side of the boxes! I had no idea that the very first Oreo was sold in Hoboken, New Jersey back in 1912! Bada Bing Bada Boom! How YOU doin? Do you have another food item, recipe or restaurant that we should all try out? Tell us about it in the comments below! Do you have another song that fits today’s themes? How about a song that doesn’t fit today’s themes but is just so great that we should check it out anyway? Tell us about it in the comments below! Okay peeps, I should probably close this out before that cereal sugar crash kicks in! But before I go, I’d like to invite you to also follow me on social media by clicking the icons on the side panel! Also, please don’t be shy! Leave a comment below before you leave! I’m also proud to announce that we’ve added another affiliate discount for you! You can now save 10% off your purchases at RiptApparel.com by using discount code: DOUBLEFML at checkout! They have some really cool pop culture tees and bags including a full line of Black Panther items! Check out our #DoubleFML Deals and Discounts page often as we’re constantly looking to ad more hookups for you to take advantage of! Last but not least, RIP to all of the victims of that horrific school shooting in Florida last week. This meme is unfortunately an accurate depiction of how the world reacts when events like this take place. We throw a few hashtags up, send thoughts and prayers, fight about gun laws on Facebook for a few days and then forget about everything until the next tragedy strikes. Hopefully we can find a way to break this horrific cycle before more innocent lives are lost. Next Post Out of this World! Been out of pocket on a cleanse …hard to read about food and cleanse. My mom actually surprised us last week with the new cookie flavored cereals. I personally don’t eat cereal, but my son went nutzo over them. While I am still enjoying this post, I am going to comment now before I try to find those nutter butter cereals! They all sound great, but this is a “must have” for me. POST should definitely recognize you for your “fantastic” reviews of their new products!!!! I am sure the sales will go up as a result of your endorsing review of each one of them! All I can say about Fergie’s rendition of the Star Spangled Banner is UG!!! back to the drawing board!.. lol. Great post!!! I can’t believe that stores are getting ready to stop selling Cds… I’m “old school” what will I do? lol I remember when they stopped selling cassette tapes, I was devastated, but some how I made it. lol. Love your Doublefml business card!!! Chris’ small slice of pizza would definitely be no challenge for you. I bet you could down one twice that size if that was you thing!!!! Love all of the memes and pics. I see that your girlfriend is having a definite impact on you. WOW, I can’t believe that you missed the 1st showing of Black Panther at her request. Something is happening…….. ! I am sure that you will enjoy seeing it better the first time with her!!!! Ha, yeah I’ll wait a week – but if she can’t make it this Friday, I’m going alone. I keep hearing how great it is, I’m ready to go! Thanks for this post and for motivating me in my fitness efforts. My success story….After modifying my fitness workout and incorporating more toning stretches and routines, I now “look more decent ” in most of my size 8 suits. I still have work to do!!! lol Great food reviews! Thanks for your constant theme of never giving up on our dreams. That’s awesome that you’ve been getting more fit with those changes! That’s awesome Faith! Keep going!!!! You can do it! Congratulations!!! Thanks Mildred! I’m glad you enjoyed the post! We’ll have to check out these mix tapes some day. lol there was definitely an art to it! Still laughing BTW Stormy took a SIP not a gulp. Pingback: Out of this World! – #DoubleFML FatDarrellPalooza! Pingback: Fake It Till You Make It – #DoubleFML FatDarrellPalooza! Pingback: Florence + The Machine – #DoubleFML FatDarrellPalooza! Pingback: Hum-tea Dumb-tee – #DoubleFML FatDarrellPalooza! Pingback: Milk is Chillin – #DoubleFML FatDarrellPalooza!